What Are the Benefits of Azo Cranberry Tablets? The discomfort and pain associated with a urinary tract infection can be severe. Also known as cystitis, a urinary tract infection occurs when bacteria enters the passage through which urine is excreted, called the urethra. According to Health Central, about 90 percent of urinary tract infections are caused by a bacteria called escherichia coli. This bacteria exists harmlessly in the intestines, but causes infection when it enters the urethra or bladder. Azo Cranberry Tablets are an over-the-counter preventative product for maintaining urinary health and avoiding infection. If you are concerned about a possible urinary tract infection, contact your doctor. One traditional home remedy approach to preventing urinary tract infections or relieving their discomfort is to drink cranberry juice, and according to MedlinePlus.com cranberry is and effective treatment against UTI. Cranberry juice may help prevent the attachment of bacteria to the bladder. Azo Cranberry Tablets are made from early black cranberries, which are rich in compounds called proanthoycyanadins. Proanthoycyanadins act to block the attachment of bacteria to the bladder wall. While cranberry has long been considered a home remedy, it is not a medical treatment. Azo Cranberry Tablets also contain the probiotic lactobacillus, which is known as a "good" or "friendly" bacteria, according to the University of Maryland Medical Center. You may be familiar with the benefits of probiotics, which are frequently used in many health care products and foods. By nurturing the "good" bacteria in your intestines and digestive tract, you can prevent the overgrowth of harmful bacteria. 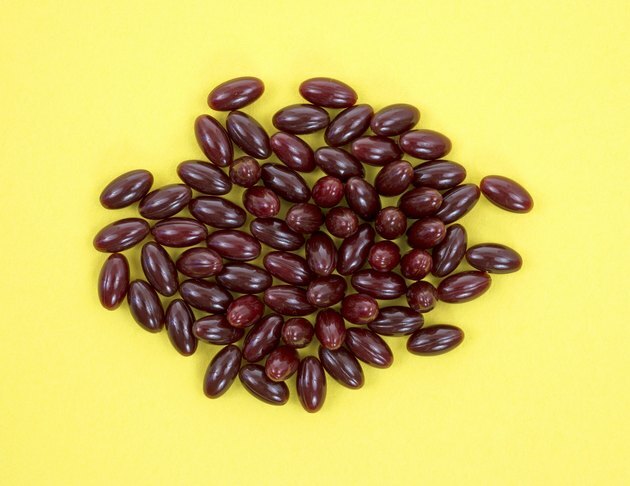 The lactobacillus in Azo Cranberry helps maintain a symbiosis of intestinal and digestive flora, which may prevent unhealthy bacteria from attaching to your bladder or urethra. Probiotics are highly regarded in many foods and supplements, but aren't proven as a medical treatment. Azo Cranberry tablets contain 60 milligrams of vitamin C, and the recommended dietary intake for women per day is 75 milligrams, and 90 milligrams for men according to the Linus Pauling Institute. Vitamin C is an antioxidant, which means it combats harmful free radicals in the body. Free radicals can be damaging to the body's cells and lead to various health problems. By protecting cells and guarding against free radicals, vitamin C may be useful in supporting immune function and overall health. As with most vitamins, vitamin C is a well-regarded dietary supplement but not a medical treatment. Although drinking cranberry juice may be a favorite home remedy for relief of urinary tract infections, it is not a calorie-free remedy. A cup of unsweetened cranberry juice contains approximately 116 calories, and often, more than one cup is needed to achieve urinary benefits. According to the Azo Product website, Azo cranberry tablets contain 2.5 calories per tablet. This may make the tablets a more favorable option if you are watching your weight.